Barbar Temple is part of the Tentative list of Bahrain in order to qualify for inclusion in the World Heritage List. We visited this site recently after seeing both Bahraini's WHSs. We drove towards the Oil Museum, then back through many burial mounds and ended up in the village Barbar. There are three temples on this site, one on top of another, the oldest one dating 3000 BC. The culture was Dilmun, the temple apparently dedicated to the diety of the freshwater. There's a well with steps leading down towards it as a part of the site. The most popular find was the head of a copper bull that's one of the symbols of Bahrain and a symbol of the site. It can be found in the National Museum in Manama. The site can be found off the main road, it's signposted. In front of it is a large sports playground, parking spaces are available. There's no entrance fee, you just wave to the guy guarding the place. There's a lovely paved footpath circumnavigating the diameter of the excavation site. 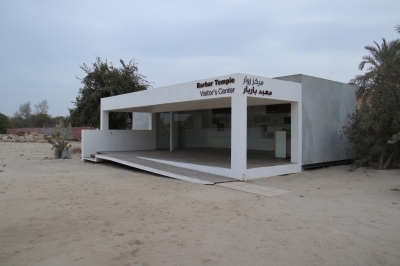 As a part of the efforts towards subscription, a brand new visitors' centre was built. Info panels are in English and they tell the history of the site, archaeological digs and have interesting pictures. The overall visit takes no more than 30 minutes and is easy to do when you navigate around Bahrain with a rental car. I was driving around looking for Bahrain Fort, but ended up at a sign for the Barbar Temple. So I decided to visit this Tentative Site first. It's a small archeological site in a residential area. A couple of men were doing maintenance work at the site, but there were no visitors. Besides the subterranean shrine as pointed out by Paul Tanner in his review below, the offering blocks and pierced blocks that are thought to be tethering points for sacrificial animals are also noteworthy. There's a sign board at the entrance telling the history of the temple (there's no entrance fee). Via a paved path one can circumnavigate the dig. It's a rather small site that I guess will never make it into becoming a proper WHS (or only maybe as part of a serial nomination). P.S. : the Manama-suburbs (Karbabad) that lie near this temple are quite poor and ostentatively Shiite. Black flags by the side of the road, billboards displaying religious leaders, mosques heavily painted and also decorated with black flags. I had never seen anything like this before, only on TV when Hezbollah-sites in Lebanon are shown. We visited most of Bahrain’s T List sites in 2005 and, with Bahrain hosting the 2011 WHC, are interested to guess which (if any) might be inscribed as that country’s “reward”! Could it be the “Barbar Temple”? 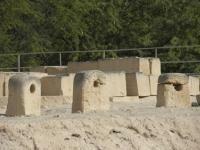 These remains of the Dilmun civilisation date back 4-5000 years. Any structure that ancient is of interest and anyone with time to spare in Bahrain should aim to take in the site – though the visit itself is only likely to take about half an hour. When we were there it was not well laid out/explained though no doubt a lot more could be done to improve this aspect – as Bahrain has shown it can do when gaining inscription for the Fort. The main interest to me was the entrance to a spring of water (photo). It was thought that the site was dedicated to Enki the god of “Wisdom and the sweet waters under the earth”. Bahrain’s geology provides aquifers which must have seemed miraculous all those years ago. But a WHS?? I think not. The Bahrain Fort inscription already includes Dilmun remains – though these are not that visible at a site dominated by the Portuguese fort. Perhaps Barbar could be included in an inscription of multiple Dilmun remains. But every extra location creates problems for gaining inscription in terms of buffer zones, management plans, stakeholder reviews etc so there is an inbuilt disincentive to include too many sites in any inscription and really Bahrain has rather cut the ground from under itself by already including some Dilmun remains in the Fort inscription . I would expect Barbar Temple to remain its same sleepy self way past 2011!